This is a guest post from Maria Rainier. Maria is a freelance writer and blog junkie. She is currently a resident blogger at First in Education and performs research surrounding Online Degrees (onlinedegrees.org). In her spare time, she enjoys square-foot gardening, swimming, and avoiding her laptop. If you’re struggling with infestations of green flies, red spider mites, or any other type of aphid or mite, the solution to your problems might be lady beetles. This is especially true if you have edible plants, heightened chemical sensitivity, or any other reason to avoid chemical pest control. Your neighbors will even thank you for keeping chemicals out of your yard because pesticides often drive out beneficial insect predators within a wide radius. If you want to keep your yard and the land around you free of chemicals, keep a balanced population of lady beetles in your garden or around any deliberate vegetation you might have in your yard. 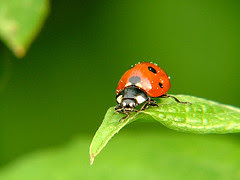 As larva and adults, lady beetles feed on both aphid and mite eggs as well as the adult pests. Where you would have to combine different pest control methods if you chose to use chemicals or other solutions, lady beetles can take care of your problem in all of its stages. Another great benefit is that maintaining a lady beetle population can both eradicate current infestations and prevent new infestations from occurring. Lady beetles consume at least their own weight in pests each day and are fast predators, so you won’t have to worry about pests escaping from them. Within two or three weeks, a balanced population can take care of most infestations. However, even when your problem seems to be solved, you’ll want to keep the lady beetles around as a preventative measure. Before you try buying lady beetles, make an effort to attract them. You’ll save money and won’t risk causing an imbalance in your garden’s delicate ecosystem. If this doesn’t work, you can move on to purchasing lady beetles, but there are some simple steps you can take to try attracting them. So what keeps lady beetles coming back for more? The answer is simple: food. If you have an aphid or mite infestation, you already have an excellent lady beetle food source, but you may want to place attractive plants closer to your garden’s border to lure the lady beetles in. Besides aphids and mites, lady beetles are attracted to pollen and nectar from plants like alfalfa, goldenrod, morning glory flowers, dandelions, Queen Anne’s lace, and grains like buckwheat. If you don’t want to plant these in your yard, you can try offering artificial foods like BugPro, although lady beetles will prefer natural food sources if they have a choice. Once you’ve managed to get a lady beetle population, maintain it by avoiding insecticides and other harmful chemicals. Your population will also need a food source once your aphid or mite infestation has been eradicated, so it’s important to keep the aforementioned plants and/or continue to provide artificial food. population’s stay in your garden. Note from the editor: Do you already have a nice ladybug population? In case you don't, you can buy ladybug attractors from Garden.com or go for the big game with 1500 live lady bugs from Amazon.com . Last February we bought a chocolate mint plant in the shop of the Botanical Garden in Madrid. It was an almost dead plant, with just a few offshots and 20 or 30 small leaves. But we loved the smell, and thought it would come out well. Indeed, it has been growing steadily since then, and we planted a lot of cuttings out in the garden, where they are growing slowly but steadily. It needs a lot of water (and cuttings will grow roots very easily just in water). Our main indoors plant is so happy where it is that it started flowering this July. For now, just two buds, one in the picture and the other just appearing. 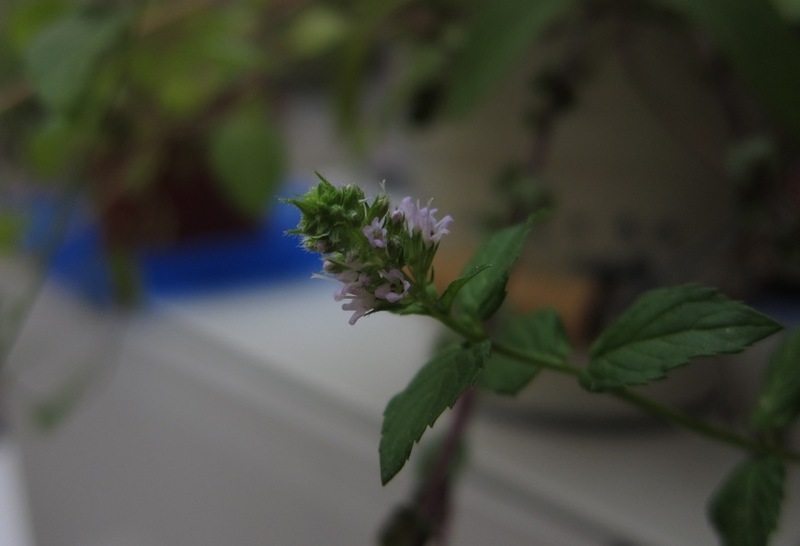 It is the first time one of our mints flowered! Chocolate mint does not exactly smell like chocolate, but something similar to a box of After Eight when you have eaten all the chocolates. They can be used like regular mint to add flavor to your dishes, and there are also several specific recipes to enjoy the special taste. As an example, here is a chocolate mint syrup recipe and here another recipe for home-made chocolate mint ice cream. If you find a batch of chocolate mint, don't doubt and buy it, even if it looks like it will die tomorrow. Water it and see it grow! If you already have a chocolate mint plant, what do you use it for? This is a dragon fruit, also known as pitaya or pitahaya. It is called dragon fruit because it has scales in the outside and has brilliant colours. They can be red skinned with white flesh, red skinned with red flesh or yellow skinned with white flesh. Dragon fruit does not grow from a tree, but from a cactus. Thus by growing dragon fruit seeds you will get cacti. The particular type I used is red-red. Dragon fruit is not very tasty, you should not eat it with strong tasting foods. I found it very good, despite this. To eat your dragon fruit, cut in half and eat the flesh with a spoon. The flesh is full of seeds, like a kiwi, and these are the seeds you need to get a dragon cactus. From a spoon of dragon flesh you can get plenty of seeds, more than you will need. Dragon seeds have a high germination rate, with just 15 or 20 you can grow as many dragon cacti as you want. After eating your dragon fruit, you will probably leave a little flesh and seeds close to the skin of the fruit. Remove it with a spoon, and clean with water to remove as much flesh as you can. The next step is really boring. Pick a paper napkin or something similar and one seed. Press it with your finger against the paper towel, rubbing it. Repeat until there is no flesh left around the seed. Keep repeating until you have enough seeds. An interesting fact is that when these seeds sprout, they develop a hairy root which adheres to the substrate. This means that sprouting them with the paper tower method can be hard: when you have to remove the seeds, you have to pick also the paper, they are strongly attached to it. I had better results by sprouting them in a glass with wet cotton. They will start sprouting in 3 or 4 days, and start developing two leaves, which will disappear as the cactus grows. To commemorate this year's Earth day, I have started a little project: The big lemon tree giveaway. If you enjoy it, please share it with your friends through StumbleUpon or Twitter! The plan: germinate as many lemon seedlings as I can to give them to friends and acquaintances. I will sketch here the procedure you have to give lemon seeds in order to speed its germination. A year ago I was able to successfully germinate a few lemon seeds, which turned into 3 nice lemon seedlings. Sadly two of them died, but the other one is thriving. I want to share the experience of growing a little tree with everyone. You can look at the pictures from the post I wrote a year ago. I hope you join me in this project and germinate as many lemons as possible to give them as presents to people you care about. Come on and join me! I am sure you still have plant one tree in your life's to-do list. As you may already know, I have a post (and a few follow-ups: after 3 weeks and after 2 years) on easy tips for lemon seed germination, which have gathered quite a few visits since I wrote them. They have also collected a few comments, with really useful tips that I want to share with you now.